We have updated our website to reflect our diverse activities in the Cornwall area and how together we can transform our communities. 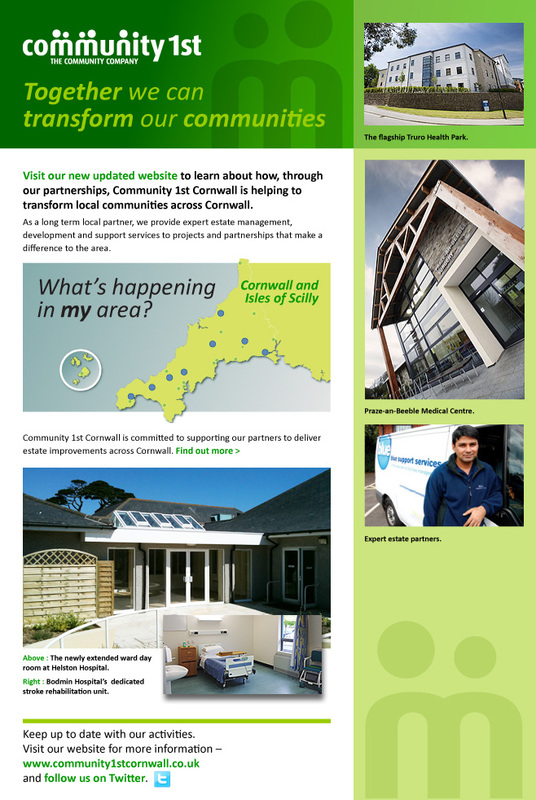 The fresh new design of the website offers quick and easy access to news and case studies about our projects and developments in the Cornwall area, community engagement events and much more. The website features an interactive map with all the LIFT schemes where Community 1st is involved which include medical centres in operation, upcoming projects and numerous capital works projects delivered to improve health estates across Cornwall. “We are very pleased with the stylish design and easy navigation of the new website and hope visitors will have a much more enjoyable browsing experience finding their way to useful information in few clicks. Our special thanks go to Pure Creative who designed and developed the website for us”, said Rod Hulme, General Manager of Community 1st Cornwall.